CAIRO For the first time since Egypt's new Islamist president took office, his supporters clashed with liberal and leftist protesters in Cairo, storming a stage erected by the opposition activists, smashing loudspeakers and tearing the structure down during competing rallies Friday. The melee between supporters and opponents of President Mohammed Morsi reflects deep political divisions among the country's 82 million people, more than a year after the popular uprising that toppled Hosni Mubarak. Egyptians are struggling with a plunging economy, deteriorating security and disputes over the writing of the country's new constitution. They were also stunned by a verdict earlier this week that acquitted 25 Mubarak loyalists on charges of manslaughter and attempted murder during last year's revolt. Liberal and leftist groups had called Friday's protest to demand more action from Morsi after his first 100 days in office. The liberals also want greater diversity on the panel tasked with writing Egypt's new constitution, which has been packed with Islamists, including members of Morsi's fundamentalist Muslim Brotherhood. Following calls for the protest, Morsi's supporters called for a separate rally to demand judicial independence following the acquittals of Mubarak loyalists Wednesday. The former regime figures were acquitted of organizing the so-called "Camel Battle,"  an incident on Feb. 2, 2011, when assailants on horses and camels charged into crowds in Cairo protesting against Mubarak, leaving nearly a dozen people killed in the assault. 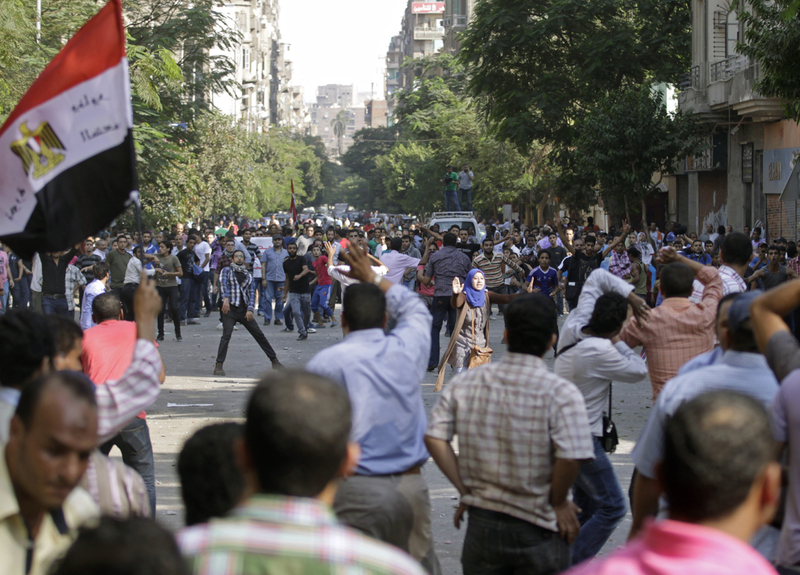 Around 1,000 protesters died across Egypt in the 18-day uprising that toppled Mubarak. Friday's melee erupted after Morsi's supporters stormed the activists' stage at Cairo's Tahrir Square, angered by chants from the opposition they perceived as insults to the president. Protesters were seen with bruises and scrapes as the two camps fought with fists and sticks. Gunshots were also fired. Meanwhile, Morsi was in Egypt's second largest city, Alexandria, on Friday, where he pledged that former regime figures would be brought to justice despite Wednesday's verdicts. He invoked the "martyrs of the revolution," including Khaled Said who died at the hands of Mubarak's police in Alexandria in 2010. Images of Said's severely disfigured face that had circulated widely online, helped galvanize calls for last year's uprising that eventually overthrew Mubarak, after nearly 30 years in power. "All of the segments of Egypt's society were deprived of many rights" under Mubarak, Morsi told a crowd of supporters. "And the biggest right deprived of us was the right to freedom." Following the acquittals of the 24, Morsi on Thursday dismissed the country's prosecutor general  a Mubarak appointee  in a bid to calm widespread anger. However, the prosecutor, Abdel-Maguid Mahmoud, refused to step down and vowed to remain in his post in defiance of Morsi citing a law that protects the prosecutor general from being ousted by the president. Mubarak is serving a life sentence along with this longtime interior minister for failing to stop the killing of protesters last year. After the clashes in Tahrir Square, the April 6 Movement, which played a significant role in bringing down Mubarak, said its supporters would march to the prosecutor's office and protest there instead. Caught in the scuffles, Ashraf al-Said said he tried to calm both sides but instead found himself doused in white paint thrown onto the crowd. "I am here with the revolution, the people and Egypt. I am not with anyone side," he said, his hands and hair dripping with white paint. "What we are doing now is a sin."